These days, I suspect many conflate and confuse the difference between Memorial Day and Veterans Day, which are not the same thing. For more explanation you can read about the difference between the two holidays. If you want to use the long weekend for what it was intended for, take some time to visit Soldiers and Sailors Memorial Hall, which is open for visitors on both Saturday and Memorial Day. 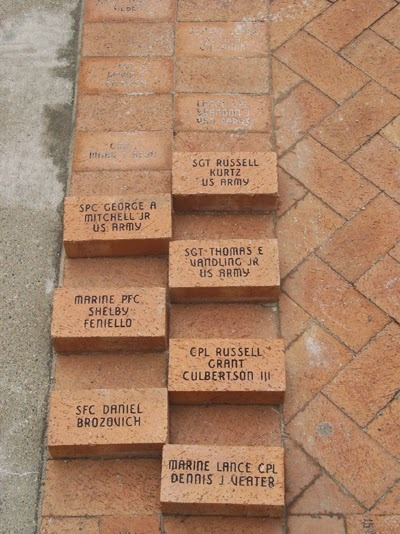 If you do visit Soldiers and Sailors and really want to appreciate what the holiday is about, look down at the bricks, many of which represent recent veterans who lost their lives in combat. I'll resue the photo I took a few years ago with just one tranch of new bricks. Each of these are of local servicemembers KIA in recent years including: Sgt Russell Kurtz, Cpl Russell Grant Culbertson, Sgt. 1st Class Daniel A. Brozovich, Sgt. Thomas Vandling Jr., Pfc. Shelby J. Feniello, SPC George A Mitchell, Cpl Dennis Veater. I suspect there have been more new bricks added since then.